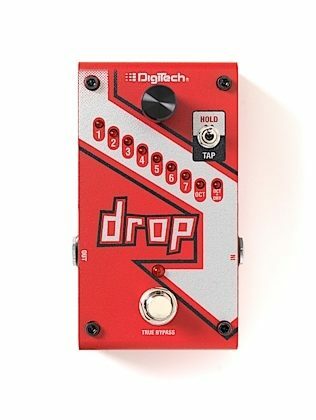 The DigiTech Drop is a dedicated polyphonic drop tune pedal that allows you to drop your tuning from one semitone all the way down to a full octave. Get down-tuned chunk without having to change guitars. The Drop also features a momentary/latching switch. With the switch set to momentary, you can turn the Drop into a true performance pedal. Fast trills and roller-coaster pitch dips are at the tip of your toes. - Dimensions: (L x W x H) 4.75 x 2.875 x 1.75"
Overall: I'm in a band and we play 90's-00's covers. We always play the songs in the key they were wrote in. So as you can imagine you need a bunch of guitars ranging from E to C. This was a big issue for guitar and bass. So we did some research and decided to give this a try. This pedal saved us in many ways. Not only did it reduce bringing 5 guitars to a show to just 2, it's how well it does the signal change. There is virtually no difference 3 - 4 half steps down. You start to hear a little fake-ness the further you go but again it's almost unnoticeable. Also the latency for solo's was incredible. I highly recommend this pedal. Especially if your in a band and find bringing a lot of guitars a royal pain.